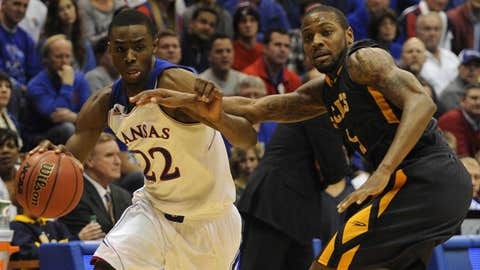 Andrew Wiggins finished his night against Toledo with 20 points and five rebounds for Kansas. LAWRENCE, Kan. — It took Kansas coach Bill Self just 35 seconds to burn his first timeout Monday night. "You know what? I screwed it up," he would explain later, "because I should have taken a timeout five seconds into the game after our first turnover." Instead, he waited until the Jayhawks had turned it over twice and let Toledo score an easy bucket before calling his team over to the sideline. What ensued was an animated discussion that centered on defense — or rather, the complete lack thereof. No. 16 Kansas responded in fine enough fashion to pull out a 93-83 victory, and deal the Rockets their first loss of the season. But it wasn’t enough to stop Self from spending about 15 minutes in his post-game news conference lamenting the sorry state of the Jayhawks defense. "You shouldn’t have to shoot 67 percent in the second half at home, and hang 50, in order to win by 10," said Self, whose teams have traditionally been among the stingiest in the nation. "They’re a good offensive basketball team, obviously, but I think we helped them, too." Perry Ellis had 21 points and 11 rebounds to lead Kansas (9-3), while Naadir Tharpe added a career-high 20 points with eight assists. Andrew Wiggins also had 20 points and fellow freshman Joel Embiid had 14 points and 10 rebounds. Indeed, scoring wasn’t an issue. It was the other end of the court that posed a problem. "Definitely, we still haven’t shown the killer instinct," Tharpe said. "I don’t think we have it at all. We just let them score too many easy baskets." After falling behind by 16 in the second half, Toledo (12-1) made one final charge, getting within 81-73 on a 3-pointer by Julius Brown with 3:23 left in the game. Tharpe answered moments later with a free throw and then a driving layup off a miss, and Kansas finally put the game away when Frank Mason fed Wiggins on a run-out for an easy dunk that gave the Jayhawks an 88-76 lead with less than 2 minutes remaining. "Not many teams have won here, or are going to win here this year," Toledo coach Tod Kowalczyk said, "but this team has an unbelievable amount of pride." Nathan Boothe led the Rockets with 15 points, despite dealing with foul trouble much of the night. J.D. Weatherspoon and Justin Drummond had 13 points each, and Rian Pearson added 10. The loss ended Toledo’s 15-game winning streak dating to last season, and put a wrap on the Rockets’ best start to a season since the 1966-67 team won its first 14 games. Meanwhile, the Jayhawks won their 68th straight non-conference game at Allen Fieldhouse. They will try to run the table again when they finish up against No. 21 San Diego State on Sunday, and then begin chasing their 10th straight Big 12 championship on Jan. 8 at Oklahoma. Before then, there are certainly issues that Kansas still must iron out. Those early turnovers and defensive breakdowns allowed Toledo to build a 22-17 lead midway through the first half, and then closed within 43-36 at halftime. Toledo hung around early in the second half, again making the most of its prolific outside shooting. But the Jayhawks finally went on a 3-point binge of their own, and a three-point play by Embiid produced a 68-52 cushion with just over 12 minutes left in the game. "We’ve never played a team that big, with length, so we had to adjust during the game," Pearson said, "but our guys fought hard." The Rockets whittled the lead to 70-60 a few minutes later, but Kansas answered with a run-out jam by Tarik Black, a basket by Ellis inside and a three-point play by Wiggins – the third time in the game the uber-athletic freshman converted while getting fouled. Every time the Jayhawks threatened to put the game away, Toledo stubbornly stuck around. It wasn’t until Tharpe’s driving layup and an emphatic dunk by Wiggins that left the entire goal stanchion shaking that the crowd packed inside the Phog could finally exhale. Not surprisingly, Tharpe said the post-game message in the locker room was spent stressing defense. The Jayhawks allowed Toledo to shoot 46 percent from the game while forcing just eight turnovers and making four steals, hideous numbers for one of Self’s teams. Self continued to voice his frustrations with his defense in his news conference, and at its conclusion the miffed coach plastered a big grin on his face and declared — somewhat sarcastically — "and everybody have a damn happy New Year!"